This is the second part of Shop Local in Auchterarder continuing with my purchases shown in the first video which can be seen here with an accompanying video for this piece here. 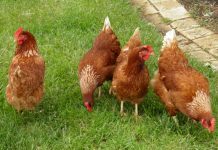 The chicken bought from the local butchers was slightly more expensive than if I had purchased it at the local supermarket but the quality was far superior. From this one chicken I have produce 4 adult chicken dinners with enough left over for 4 portions to be frozen and used for curry/sandwiches/backed potato fillings etc. The carcass was then boiled to produce a base stock for soup using some of the carrots and one of the large onions along with the bag of lentils. Tonight, we shall be having the mince and using up the rest of the carrots and potatoes and one of the onions. This will again produce enough for two adult portions. 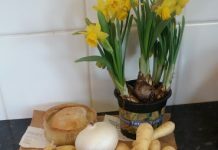 When I first started my shop local in Auchterarder posts, I wasn’t sure just what was going to happen but I must admit I am enjoying getting back to cooking again. Granted, having a freezer is a bonus as is having a food processor which saved me having to grate the carrots this morning for the soup. Only a couple of months ago, I would never have thought I could be making soup before being out the door for 9am. I am now looking forward to when I get home and can have a bowl of homemade soup, the rest will be frozen and ready when needed. Shop local in Auchterarder is definitely working out on this shopping trip at least. For less than £15 there has been 4 full sized chicken dinners, 2 mince and potato dinners, 4 portions of chicken and a very large pot of soup. This series will continue on Monday with another shopping expedition and accompanying video.